One of my new favorite activities is craft swaps. It’s so much fun to craft with a purpose especially when Christmas is too far off to worry about, and no baby blankets are on the horizon. In the Spring I took part in The Office swap where we made our partners something knitted/crocheted around the greatest TV show on air. 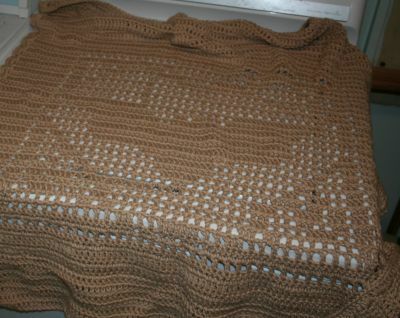 For my partner, I made a batghan – a lapghan inspired by the episode where Dwight tries to catch a bat that has made a home in the office. I found a bat Fillet crochet pattern on About.com’s Crochet section and used that for the center. I just filled in the rest with double crochet. I used Hobby Lobby’s cotton yarn which probably wasn’t the greatest choice as it seemed to ‘shed’. Cotton yarn is one of my favorite yarns to work with. I just love the bright colors from cotton yarn although for this project I chose a dull, boring beige. Welcome to CrochetMae! I’ve been crocheting for a little over a year but learned over 20 years ago from my grandmother Palmae. Oh how I wish I had been more interested and not so discouraged when my granny square was more of a granny circle. 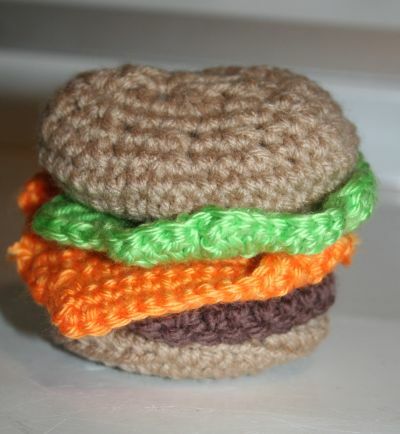 I would totally rock by now with mad crochet skills. Here is where I will share my creations from both my own and other’s patterns. My goal is to one day create something worthy to put on Etsy. A blog helps me organize my thoughts and ideas better than any software or even plain pen and paper. I’m always more inspired when writing. I did have a blog at Today.com but my account was closed due to inactivity(not from my crochet blog but from another blog I had). Instead of starting another free blog, I decided to register a domain since I love the freedom that comes with hosting your own blog. Thanks for reading this far and hope you find some inspiration here.